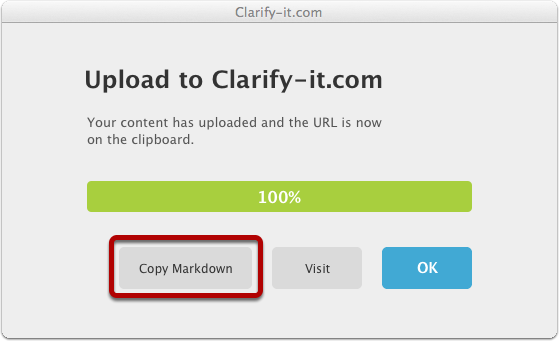 When you share a Clarify document via a web service such as Clarify-it.com or Dropbox, Clarify can place the resulting document content on the clipboard with references to the images hosted on the web service. 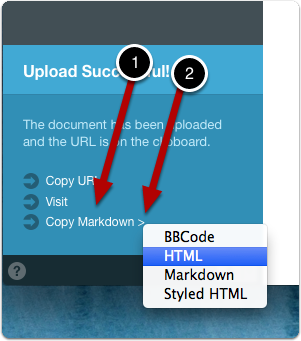 This makes it easy to easy to share Clarify documents in web forums, help sites, or anywhere else you can post HTML, BBCode and Markdown. Create a Sharing account that exports to the web. 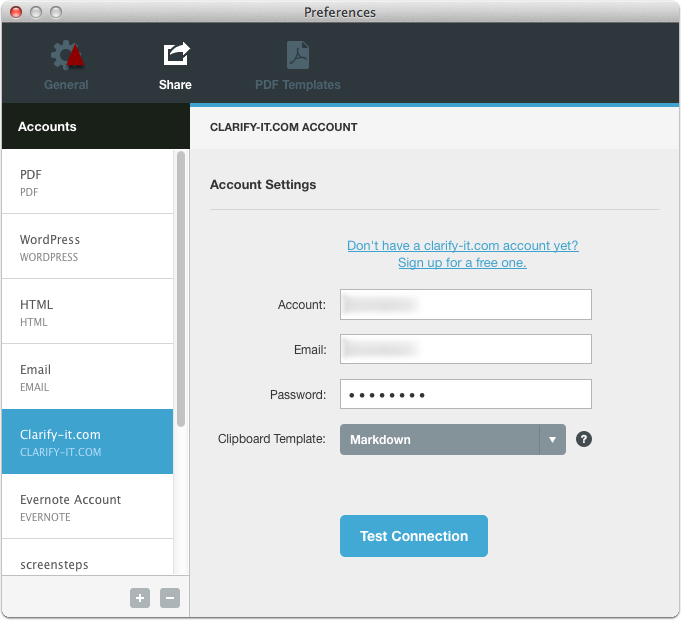 In this example I am configuring a Clarify-it.com account. I could also use a Dropbox account. From the Clipboard Template menu, select the format you would like the document converted to after it is uploaded. 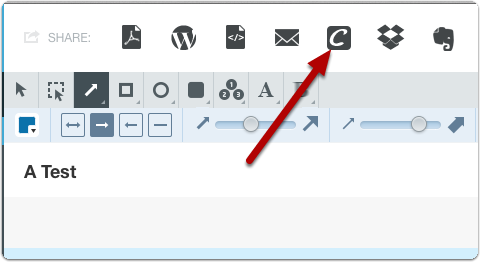 Click on the Share icon in the toolbar to share your document. In the resulting dialog, click the Copy Markdown button (the actual title of the button depends on the format you chose). This will use the clipboard template you selected to convert the document and add the image references. Since I selected the Markdown template, this is an example of what would be placed on the system clipboard for a document with a single step. Some instructions for you to read. You can also copy the clipboard template text to the clipboard using the Notification Center. 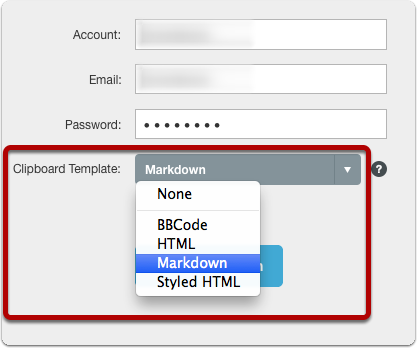 Click on the Copy Markdown link  to copy the default template or click on the arrow  to display a list of all of the available templates. If you want to copy the document to the clipboard using a different template, you can do so from the document inspector. 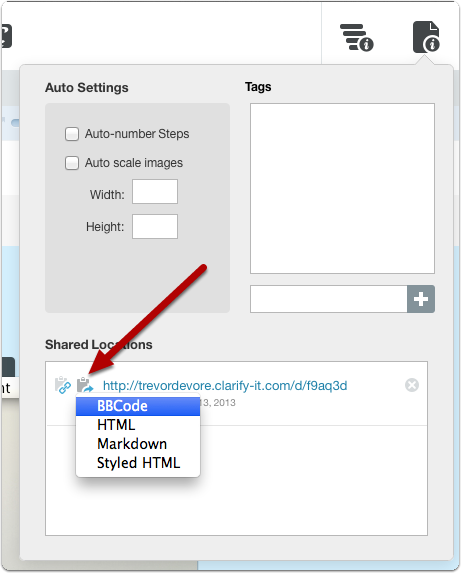 Just click on the clipboard template button in the list of Shared Locations. Prev: Why does my document need to be saved after exporting to a web sharing account? i totally don't get which clipboard template to choose. @chiraya I agree that sharing a link is probably the best way to go so you probably don't want to use this feature. If you want to share a PDF via Dropbox just export a PDF to your Dropbox folder. You can then right-click on the PDF in Dropbox and get the sharing link.